Coined as the ‘Scotland of East’, Shillong is known for its magnificent hills, crystal clear lakes and waterfalls and scintillating landscapes. 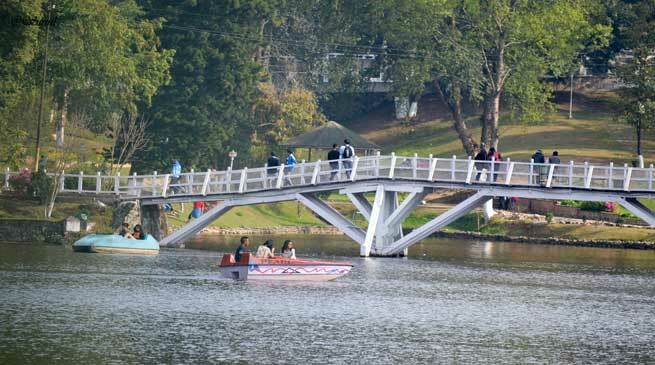 Amongst the various popular tourist destinations of Shillong is Ward’s Lake -just 2 km from the city’s Police Market. The horse-shoe shaped lake is encircled by cobble-stoned paths. Locally known as the Pollock’s Lake or Nan-Polok, it is set amidst a well-maintained botanical garden, which offers a mesmerising view of the orchids and several indigenous and exotic flora and birds. The century-old picturesque lake allows visitors to unwind amid serene surroundings as they laze around in the lush carpet of grass or go around boating. The lake, home to numerous varieties of fish, is equally popular among tourists and local residents. The pretty ornamental bridge, stood in the middle of the lake, an add-on beauty of the man-made lake.